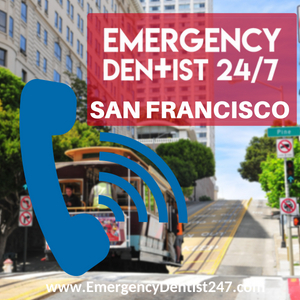 If you’re here because you’re currently dealing with a painful dental emergency that requires an emergency dentist in San Francisco, CA, just know that you’re not alone. Unfortunately, dental emergencies don’t have a schedule they need to adhere to, which means you never know when they’re ready to strike. Thankfully, you’re in the right place if you’re seeking fast, immediate help. All you have to do is give us a call at (628)-600-2752, fill us in on what you’re experiencing, and we’ll have an appointment booked for you with an emergency dentist in as little as 24 hours. While you wait for us to call you back with the time, date, and location of your emergency dental appointment, you’re going to need to go on a bit of a scavenger hunt to track down what you’ll need to bring with you to your appointment. For starters, if you’ve recently had an appointment with your regular dentist, try to find any sort of paperwork that came home with you. A copy of your patient profile, copies of dental x-rays, or even a detailed receipt with the names and costs of what you had done will do. Any scrap of information regarding your dental history will prove useful to the emergency dentist we book you with, as well as their staff. 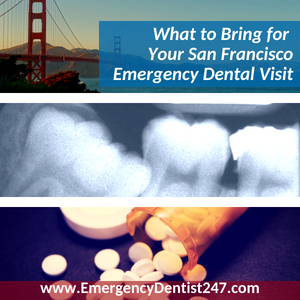 The emergency dentist and their staff will need to know about any medications you’re currently taking and if you have any known allergies, so making a list of both is important, if applicable. They need to know this information to make sure that nothing they give you during your appointment causes a reaction to your medication or an allergic reaction. Once we’ve called you back to give you your appointment information, we strongly recommend you call the emergency dentist to inquire about your insurance information and whether or not your insurance is accepted. If your insurance isn’t accepted, it’s never a bad idea to ask for a price range. This will eliminate any surprises when it comes time to pay your bill at the end of your appointment. Because emergency dentists run their offices just like your regular dentist does, you’ll need to make sure you arrive at least 15 to 20 minutes before your appointment is due to start. You need to make sure that you have enough time to fill out any necessary paperwork and ask any questions you may have without cutting into your appointment. Finally, if you have any anxiety regarding your appointment, make sure you let your emergency dentist know. 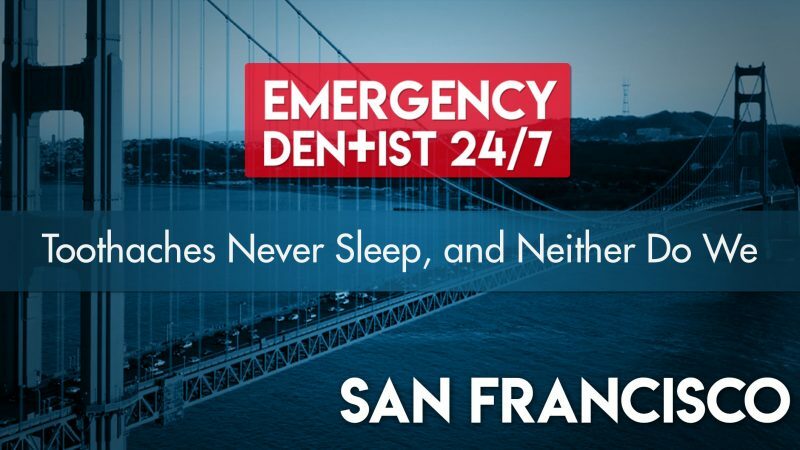 The emergency dentist and their team have dealt with hundreds of patients who are nervous, apprehensive, and even completely scared of going to the dentist, so they know how to keep their patients comfortable and make sure they’re okay throughout the appointment. Don’t be afraid to speak up and let them know how you’re feeling at any time. 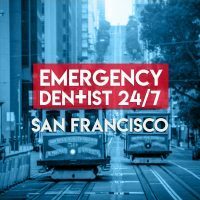 If you’re up late at night, on Google, searching for same day denture repair in San Francisco or emergency denture repair San Francisco, you’re among a hoard of patients with the same issue. To eliminate this problem, especially when it comes to the number of appointments it usually takes to repair or be fitted for dentures, we’ve included emergency dentists who work with lab technicians to our network. Patients with appointments booked through us can have their dentures serviced, or be fitted for a brand new pair, on the same day as their emergency dental appointment. Like we mentioned earlier, dental emergencies don’t run on a schedule like we do. Because of this, it’s important to know what some of the most common dental emergencies are. Knowing this information can actually help you identify when you’re going through one so you can seek help sooner. A lot of dental emergencies make themselves known to you as soon as they happen, such as a lost tooth, for example. Others, however, are the end result of underlying dental problems you’ve either never noticed until the pain began or chose to ignore. A great example of this is an oral infection. One of the most important things to remember when it comes to dental emergencies, though, is to make sure your other injuries don’t require immediate attention first. If you’ve been in a car accident and came out with head trauma, for example, you need to go to your local hospital’s emergency room to see an emergency doctor instead of an emergency dentist as soon as you possibly can. No matter how it happened, losing a permanent, adult tooth is never fun, but before we move on to what you need to do when it happens, check to make sure that you have no other injuries first. Remember, major injuries and head trauma means a trip to the ER first! If everything else is otherwise okay, the first thing you need to do if you want to save your lost tooth is find it! 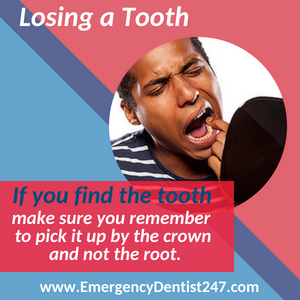 If you’ve successfully found it, make sure you pick it up by the crown, which is the top of the tooth and the part that is visible in your mouth. Picking the lost tooth up by the root is the best way to damage it to the extent where the emergency dentist will not be able to replant it back into the socket, so make sure you’re not picking it up by the root. Next, and only if you feel comfortable doing so and both the tooth and the empty socket aren’t too damaged, try and stick it back into the socket. 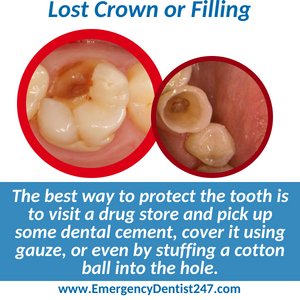 In order for the emergency dentist to be successful in putting the tooth back in, it needs to be properly preserved. If you’re unable to put it back in the socket until we can get you an appointment, however, you can always store it in a cup of either milk or water. Doing so isn’t the best preservation method, but it’s the next best thing compared to keeping it temporarily in the socket. Unfortunately, patients tend to not realize they have an oral infection or an abscessed tooth until the pain begins. This is usually because oral infections, specifically abscessed teeth, are champions when it comes to hiding. They form and grow at an easy, quick rate. Something as simple as a chipped tooth can cause an abscessed tooth, especially when the chip creates an opening to the inside of the tooth. If you start experiencing any oral pain, have a toothache, or see anything that remotely resembles a pimple in your mouth, you need to call us immediately. 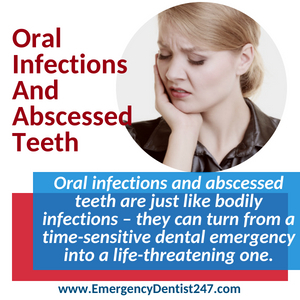 Oral infections and abscessed teeth are just like bodily infections – they can turn from a time-sensitive dental emergency into a life-threatening one. Untreated oral infections and abscessed teeth can lead to oral destruction, blood poison, and eventually death. Losing a crown or a filling may not seem like such a big deal, but patients don’t realize losing one or the either is actually a major deal. If you’ve lost a crown or a filling, the first thing you need to do is call us so we can get cracking on booking an appointment for you. Next, you’re going to need to cover the hole that the crown or filling was once in charge of. Go to your local pharmacy or drug store as soon as you possibly can and buy some dental cement, gauze, or cotton balls. No matter which one you buy, you need to make sure you keep the hole in the tooth covered at all times until your appointment. By keeping the tooth opened and exposed, you’re risking losing that tooth, especially if the crown or filling was there to cover and plug up a large hole. Food, drinks, and debris, in general, will cause serious damage to the exposed tooth, which will more than likely cause the emergency dentist to perform an emergency extraction instead of filling it back up or putting a new crown on. Before we get to what you can expect if you need to have an emergency tooth extraction done, it’s important to remember that the emergency dentist and their team will do everything in their power to first try and save the tooth before they figure out whether or not it needs to be pulled. If the tooth in question needs to be pulled, however, knowing what’s about to go down is the best way to eliminate your fears and give you an expectation to better prepare yourself for it. Remember, if you have any concerns or fears, make sure you let the emergency dentist and their team know in advance. 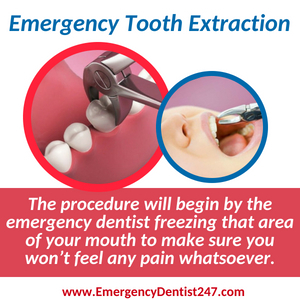 The process of having an emergency tooth extraction done will start by the emergency dentist completely freezing the area where the extraction will take place. Once you and the emergency dentist are both in full agreement that the freezing is in full effect and you can’t feel that area in your mouth, the procedure will begin. The emergency dentist will use a pair of not-so-scary dental pliers to coax the tooth out of the socket by gently rocking it around. Don’t worry, you won’t feel any pain thanks to the freezing, just some minor pressure. If, however, the tooth doesn’t want to come out, or there is some other form of a complication, the emergency dentist may have to carefully break the tooth up into smaller sections and remove it piece by piece. Once the tooth has been removed, whether whole or by the piece, you’ll be given a couple of minutes to settle. The emergency dentist will then go over some aftercare instructions with you that you will need to do at home over the course of the next couple of days. Make sure you follow their instructions to the letter at home. If you don’t, you’re risking developing an oral infection, which will land you right back where you started. Following their instructions will ensure that your mouth heals properly and that the amount of time it takes for the site to heal will be as minimal as possible. Knowing when you need an emergency doctor instead of an emergency dentist is extremely important. Making the right decision, especially if you’re in a situation that’s time-sensitive, can be the difference between life and death. For example, you’ve just been in a car accident that has resulted in a couple of shattered teeth, a broken arm, injuries to the soft tissue of your mouth, and head trauma. Who do you see first, an emergency doctor or an emergency dentist? In this case, because you received trauma to the head as a result of the car accident, you need to go to your local hospital’s ER to be treated by an emergency doctor as soon as possible. An emergency doctor can’t save your teeth, but the most important thing that needs to be treated first will always be any sustained trauma to the head. While you’re receiving treatment from the emergency doctor, make sure you give us a call so we can start on booking you an appointment with an emergency dentist to ensure that your oral injuries are treated as soon as possible.